IU vs Penn State at Memorial Stadium in Bloomington, IN. Photo by Eric Thieszen. 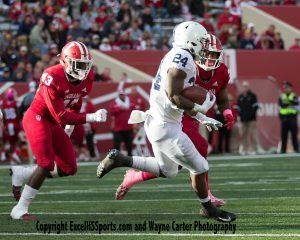 Penn State came into today’s game on a two game losing streak and had carved out some points that they needed to improve on to beat Indiana in Bloomington. 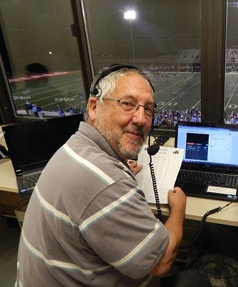 The points were throw to the tight ends, accomplished when former Decatur Central graduate junior Tommy Stevens hit 6’5 freshman Pat Freiermuth with a 23 yard touchdown pass to knot the game at 14 apiece in the second quarter. 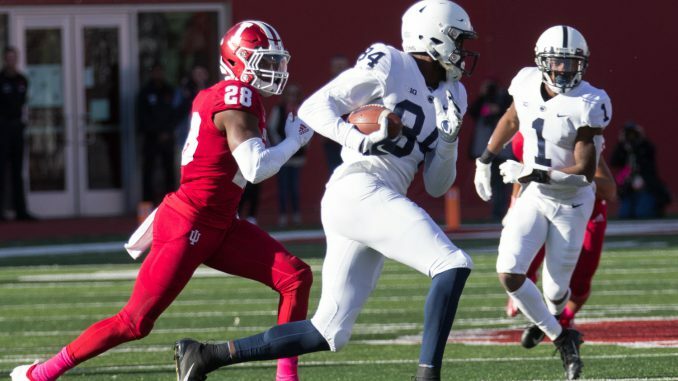 Throw the ball down field, accomplished again with 5’11 Junior running back Miles Sanders catching six passes for 54 yrds, 5’9, freshman K J Hamler four grabs for 27 yards and 6’4, Junior Juwan Johnson two catches for 72 yards. 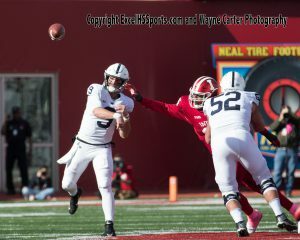 Balance their running and passing games, accomplished as the Lions rushed for 174 yards on 36 carries and 243 passing yards as Senior Trace McSorley went 19 of 36 and a pick for 243 yards. 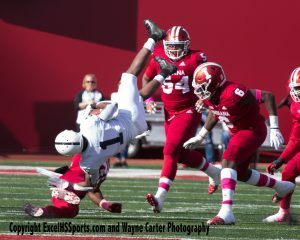 And finally make Indiana’s coaching staff make crucial decisions, accomplished as Indiana faced with a 4 and 1 opt to go with a 6’3, true freshman Michael Penix, Jr. pass that went awry in the end zone giving Penn State the ball back down only seven. Penn State went up early on a Miles Sanders one yard run and a Jake Pinegar extra point for a 7-0 lead. Indiana would even the score as freshman Stevie Scott would bust in from seven yards and a Logan Justus extra point at seven apiece. 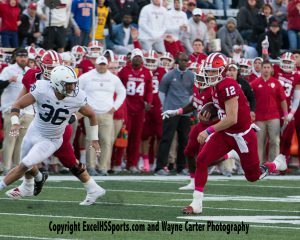 Indiana would go up 14 to 7 when freshman running back Ronnie Walker, Jr. bolted in from 30 yards to give Indiana the lead. After the Lions tied the game at 14 a piece Jake Pinegar added a 27 yard field goal and a 32 yard field goal to push them up 20-14. 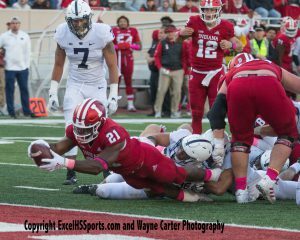 Indiana would not be done as they bounced back with another Scott touchdown on a three yard run to place the Hoosiers up 21-20. Indiana would be celebrating on the sideline with a chair being held in the air when Ohio State would take the kickoff in the hands of Peabody, Massachusetts, Senior Graduate student Johnathan Thomas went 95 yards. Quarterback Trace McSorley would take the final five yards for a 26-21 lead with 3:41 left in the third quarter. Trace McSorley would once again score early in the fourth quarter as he shaked and then baked, Indiana’s Head Coach Tom Allen’s son, Thomas with four yard run to put the Lions up 33-21. 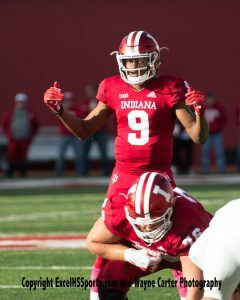 Indiana would make things somewhat interesting as Peyton Ramsey hit J-Shun Harris with a 21 yard strike to close the game to 33-28 with just 49 seconds left in the game. Indiana would cover the onside kick but fail to score as time expired. McSorley led Penn State with 127 yards of rushing on 19 carries and Miles Sanders would tally 75 on 15 carries. Sanders led the receiving corps with six grabs for 54 yards. Indiana was led by Stevie Scott with 138 yards rushing on 26 carries, Ronnie Walker tallied 40 yards and Whop Philyour added 26 and Penix added 24 on the ground. Peyton Ramsey was 26 of 36 with one pick for 236 yards and Penix went nine of nineteen for 94 yards before he went down with a undisclosed injury. Senior Luke Timian caught six passes for 58 yards while Donovan Hale totaled 52 yards on four catches.